Thought this maybe useful as we need to look after are carp, feel free to add to this. When the fish has been netted allow it a few moments rest before lifting from the water. The longer the fight the longer time the fish should be given to recover. Allways check the fins are lying flat against the body before lifting. Before lifting check the hookpoint Is not exposed,as this can tear against the weight of the fish. If possible remove the hook with the fish In the water before the lift. Position the unhooking mat so that the fish is transported the shortest possible distance. Ensure the unhooking mat has been wetted before the fish is placed on to it. Ensure the mat is large enough to safely cushion the fish. Lay the fish gently on to the mat,again ensuring that the fins are not twisted or bent backwards. Carp should never be put on their stomachs,as it contains vital organs & is highly sensitive. lip,this should simply pop the hook out with minimum fuss. For deeper hook holds it may be necessary to use a pair of forceps. Again look at the fins to make sure they are not bent. Before the weigh, make sure the sling is wetted and zero the sling. If you can get somone to slip the sling under the fish as you hold it low over the unhooking mat. If the carp flaps. lower it back down to the mat and lean over it,If It flaps before you can get it down to the unhooking mat, then hold the fish firmly to your chest with both arms around it, at the same time lean forward so that the carp is close to the unhooking mat. 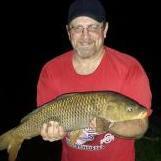 Try to return the carp as quickly as possible, carp should not be out of the water for more then a few minutes. useing the sling simply unzip the end (with head pointing out) and flood the sling with water, the carp should swim out. Occasionally the carp will need alittle time to recover before swiming off,support the fish until its ready to go. Interests:Fishing for carp of any size with varied equipment. Very good guidelines. I suggest that people print these, laminate if possible and read, read, read in between bites. GOOD STUFF! Thanks Ray, most of this came from Fox, But I thought It would be a good to type and post, I see so many pics of carp not put on a mat or even grass (the next best thing), Im not judging anyone, But putting your fish on a hard or rocky ground to take a pic, just seems wrong (to me) as we all know that carp like to flap around. I dont want to get into a slanging thing over this, but a $10.00 carp mat dose not seem to much to pay and Im sure the fish will be greatful. Interests:fishing, nature, the outdoors, and music. I am a Christian committed to Jesus Christ and very interested in raising our family in a positive, life-embracing environment. I am also intersted in philosophy, theology, and history - especially Ancient history. Me and you both Jonathan, I still find myself making mistakes, but not as many as I used to, I just try to get them back In the water as fast as possible, I only take pics of fish over 15lbs, anything under, I just unhook and let go, most of them dont leave the water. I just wish some of the bigger unhooking mats with the high sides were alittle cheaper, Nash makes a great unhooking mat, with large sides to stop the fish from leaving the mat, I forget the price but It's up there. One thing I'd like to add. If you wear a watch, please remove it before pickung up a carp. Steel clasps can, and will, cause damage. Uhh--That raises the question----- why would anybody pick a carp up??? That causes damage in itself, and really raises the risk of dropping one by a few % points. They ain't kitty Kats.---and they stink. Yeah--But Kats land on their feet--always-----unless you ----Oh--never mind. Seriously though, if I ain't weighing them, I unhook them on the mat still in the net, and put them in the water without touching them. When I begin a session I always set up all the safety gear first. If I have the mat out, slings and pliers in place, a pail of water handy and the net put together and waiting before I assemble my rod and bait up, it will save the pandemonium of a sudden fish on and no where to put it. It's a routine now. The landing,care, and releasing of fish leaves alot to be desired here in the States from what I have seen. Everyone thinks that hoisting a fish onto the bank or into a boat is the way to do it, since the Pro's they watch on the tube all do that. I have been to stores in 2 different states, and finally had to order an unhooking mat from across the pond because I can't find one here, and the selection of nets is just awful. I bought the best one I saw. It's from Frabill. The mesh is small, and it has been large enough to land the biggest Carp I caught (28 inches). All the others had mesh big enough to throw a cat through, and that was if they even had any nets at all. I have seen people unhook Cats and Pike by putting their foot on the fish, and twisting a big, barbed hook out like it was the only one they had. There are even some Bowfin videos out there, were people hoist them up 10ft onto the asphalt where they flop around bleeding out the gills and mouth, and another dragging the fish 50ft up a rock and stick strewn bank before they unhooked it. Absolutely pathetic. Actually Wacker Baits are still operational under new ownership. I bought some leads and other items last week. FYI there are outlets that sell carp gear and baits over here in the US, much of it being exactly the same brands that you will be familiar with in Europe, Click on the Vendors and Sponsors button on the entry page and you will find some options in the US and Canada. One of them (Resistance) has ceased business but I believe the remainder are still trading. I have managed to pick up most of the gear that I need to handle and release fish now. I just need to order some size 1 Daiichi Circle Hooks. The ones I'm using in 3/0 work well enough on bigger fish, but the point comes out near the eye on smaller ones. I recently got interested in carp fishing with spinning tackle and hair rigs, boilies, and the like, so logic led me want to have an unhooking mat. I looked at the ones commercially available, and didn't want to pay the price they wanted for both a mat and a weigh sling together, so I made 2 which can be used for both tasks quickly. The total cost turned out to be around $30 but I made 2 for that price, so I can get a friend into this sport and provide him (or her) one. Mine simply fold up, and have a 1/2" thick padded center.